ging houses and gathering halls throughout the United States and the production of printed material and films about Maharaj ji and the Divine Light Mission. About five hundred people all together, I guess. Since the guru had decided we had to be acceptable for the world, everyone dressed in wide robes and tight suits. Pierre Gardin, Van Gils and Laura Ashley for the executives, the junk circuit for the rest. It was about the greatest honor that could be conferred upon me as a follower of Maharaj ji, this late night phone call from Bob Mishler, international president of the Divine Light Mission. Telling me to pack some clothes and get to Denver to maintain contacts between the IHQ and the national branches in Europe and Australia. 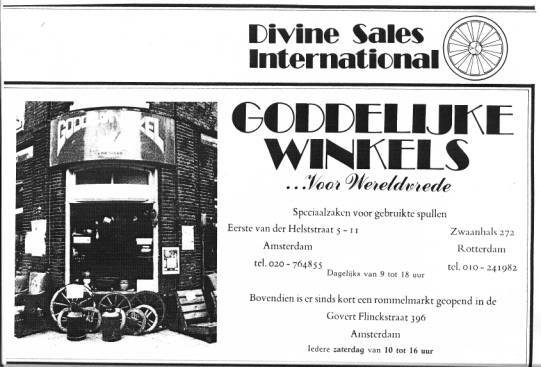 Even in Denver they agreed in the end that my predecessor assumed the role of god in the game of life a bit too much and the order came that I had to hand over the management of our junk collecting and second hand shop and become 'general secretary', of Divine Light Mission Netherlands. In stead of sorting out rags in the morning and then supplying local residents with old beds, cupboards and clothes in the Divine Shop at the Van der Helststraat, I now had to grab a suit out of the racks myself and take care of houses, money, public gatherings and personal problems of the ashram members in the national headquarters at the Achtergracht. And problems existed. Like the guy who wanted to end all the questions that despite the meditation stormed his head by first jumping in the ring canal near Diemen and then climbing an electricity pole to hang by the wire, soaking wet. He survived and stared at me in pavilion 3 of the Wilhelmina Gasthuis, stricken dumb by medication, asking if now he was a bad follower. Another guy took off all his clothes and ran through the centre of Amsterdam in the middle of the winter to announce the Lord of the Universe had descended and started his crusade for peace. He kicked a dent in my chest and a hole in the door of the room were I finally contained him, to wait for the paramedics. before we could open our Divine Shop the next morning. And such calls kept coming. An old stove from floor four. Or all that is left from granny's belongings. It paid off really well, especially since it took me a while to get the hang of income tax and VAT. After a year or so it all ran smoothly. We had money, kept our books with a professional double entry accounting system, even paid our taxes and had ashrams, junk collection and successful junk shops in four cities. Our cars were maintained in our own garage and the leaflets with 'guru Maharaj ji brings eternal peace' came from our own offset print shop. Three years after I floated like a question mark around the Vondelpark in my embroidered Moroccan shirt, I zoomed through The Netherlands in a Van Gils suit and a Triumph 2000 Overdrive, with lease contracts, appointment notes, cashbooks and tax correspondence on the seat next to me. Somewhere along the way, the quest for enlightenment had taken an unexpected turn. And I liked it a lot, to my own surprise. I could do this. meeting about international program development, still trying to find out what it meant, and about funding the Grumman Gulfstream. It was just like a real office. Exactly there, right in the centre of the Divine Light Mission, other matters too were, to a growing extent, just like the rest of the world. Nobody except his security people, his personal aids and 'president' Bob Mishler ever got to see Maharaj ji himself. But his lifestyle did affect the people that had to arrange it all for him. The job of my ashram mate Joe Schwartz for instance, was to rent films for Maharaj ji whenever he exchanged his 'divine residence' in Malibu California for Denver to discuss business with Bob. As soon as he left for Malibu again, Joe dragged projector, screen and rented films into our ashram, where we in all secrecy and taunted by the strangling question of whether we had now definitely fallen of the path watched Little Big Man and the Godfather. Two favorites of Maharaj ji, Joe assured. When I was in Denver for about a year, Maharaj ji made a European tour. Beforehand I went to all the countries he wanted to visit, to check whether the local premies had their organization sufficiently together to receive him. In practice that meant they had to have enough money and management to organize and attract people to a gathering for a few thousand people, and to accommodate Maharaj ji and his staff for almost a week in the best hotel available. So I checked if the hall they rented was big enough, the hotel rooms luxurious enough and if there was enough money to 'check out the city' with Maharaj ji. He didn't have contact with the premies that welcomed him to their country, but if he went to see the city, which he liked to do, they had to come along. To pay. The watches in Switzerland, I still remember well. One shop after another. Together with the national general secretary I followed the small group that hung around Maharaj ji like a cloud on his tour of the shiny showcases. We didn't see much of him at all. We heard his voice though when he asked a shop assistant to get a watch from behind the bullet-proof glass. When he liked what he saw, Bob Mishler signaled in our direction. Pay. While we were still finishing up doing that, the cloud had already drifted into the next jewelry shop. didn't bring enough money to pay the rent of the stadium and the thousands of hotel rooms around it. Everything would work out, was the idea, until one property after another became vacant and it became a hassle to even pay the grocer that supplied the ashrams with food. The management team, of which I was a member, had meeting after meeting, until we saw only one solution: Maharaj ji. His allowance of five hundred dollars a day had to be cut in half. Cars and houses had to be sold. Maybe even his motor home. Bob Mishler would fly over to Malibu to tell him. vice principal. And won. We all got our jobs back. Bob had explained to Maharaj ji what would happen if we really would split. Walking back on Colfax Avenue to my apartment with the long pile carpet in the bathroom and the dark wood kitchen, I longed for that truant feeling of the day before when we were all suddenly fired. Just like that time when I was on my way to kindergarten, and with a sudden insight into my possibilities turned around and just walked back home. Away from the dark door that was so heavy you couldn't possibly open it by yourself. Away from the playground where you never knew if today again you could remain on good terms with the bullies. Away from the nun, who was supposed to help and protect, but turned out scary with her harsh white hat that left red lashes on her neck and forehead. Free. You know the sky will tumble down when you do it. Too bad. The next day I stepped into Bob Mishler's's office. "I prefer staying fired", I told him. It was a short conversation. He understood, he said. So much had happened. I could arrange a ticket for Amsterdam at 'Travel'. Back home I could, no doubt, do something for the Divine Light Mission. No longer in an ashram, that was obvious of course. Meanwhile, when I was stopping over in New York with K and Jody on my way back home, that same Bob Mishler called everybody in Europe that I knew within the Divine Light Mission. Any kind of contact with me was forbidden. "He dropped out. Stay away." In Amsterdam that order was neglected for a few days, so at last I could get out of Schiphol without a penny in my pocket and had a bed for the first couple of nights. After that luckily the godless world of illusion turned out to help me out on my shaky steps back, no hard feelings. I was welcome at the university, although the academic year had already started. A student counselor listened to my story and arranged a scholarship. The woman at the student housing foundation listened and arranged an apartment in Diemen. My brother didn't need to listen. He just stood there, as soon as I had the key, unannounced on my doorstep with a jar of paint and a brush. "I'm here to help", he said. He did the ceilings, that I always hate. "Janny asked about you the other day", he said when he got on his bike again. material, websites and festivals where he speaks are used for spreading his message and maintaining contact between Prem Rawat and his followers. Maharaj ji's lifestyle seems not to have changed a whole lot. He stills lives at the 'divine residence' in Malibu, among other places. The private jet has been acquired since then.